I pulled over to a little farmhouse yesterday to buy some blackberries that were being sold at the end of the lane. Two dollars a box–such a deal. As I walked up to the table to drop my money in the honor system plastic container, a little old man came up to set more berries on the table. Covered with a faded green beach umbrella, we both huddled over the table while I gave him my money and he emptied my berries into a bag. We stood almost uncomfortably close as we both bent over to carry on our business under the umbrella. He talked a lot, mostly mumbling and called me "hon". He told me how a car had just pulled up before me. The people had gotten out, taken his "BLACKBERRIES" sign and pulled away. "You never know with people these days, hon". I told him how sorry I was that someone took his sign and how silly I thought it was and then I got in the car, grinning at the prospect of these plump little black berries coming home with me. I couldn't wait to taste the sweetness, to feel the little bulbs of juice squirt into my mouth. I had big plans for them. Simple plans. It involved vanilla ice cream. I was already figuring out how to coordinate another stop there again the next day. I told my kids no tasting them in the car. I could just picture it–blackberries being passed from front seat to middle seat to back seat. "I dropped my black berry! It rolled onto the floor!" … "Elizabeth just grabbed the black berry out of my hands and she's squishing it up in her fist!" … "Emma threw a black berry at me!!!!" When I got home, I gave them a light washing in a colander and then decided that maybe I should sneak in just one or two before I put them in the fridge for later. I popped the plump little fruit into my mouth and was immediately overcome with a face-distorting sourness. I figured I must have grabbed a bad one. I tried another and another each just as sour, or more so, than the first. I kept eating them until my fingers were purple, figuring it must be some fluke. I must have just grabbed the worst twenty in the box. The ones underneath must be better. But no. Sour blackberries. All of them. All three boxes. So instead, these got sugared. Very sugared. And left to get juicy and soft. I packed them into a bag and tucked them away into the freezer until some brisk cold day in January when I needed a little taste of (sour) summer. I did manage to save a few of the mascerated berries for myself. I snuck away after the kids went to bed and tried them over some ice cream. Still sour, but definitely good. Maybe even just the perfect amount of sour for that mouthfull of sweet…. Isn’t it funny how we’ve become so accustomed to bred-for-sweetness berries that the wild ones don’t seem sweet enough? My mom has a large field of wild brambles and it is always a toss-up which berries will be tart or sweet. I bet they’ll taste so sweet this winter when you need a bite of summer. 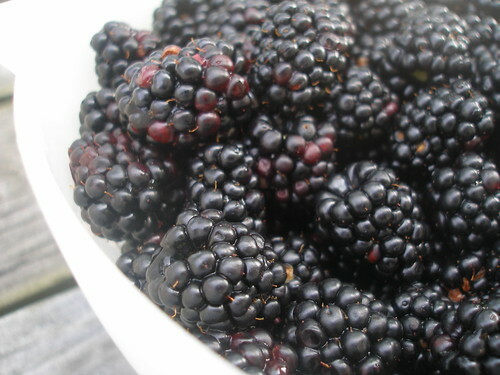 Your blackberry story made me chuckle a bit…I’ve bought some berries that needed lots of sugar recently! Sometimes, I think I should have made them into freezer jam since that calls for so much sugar! Your picture made me giggle this morning. Check out my blog picture! I need to know were the little old man is so I can get some too. Some of ours are quite sour as well…imagine someone stealing a sign…weird. Oh, I love berries. 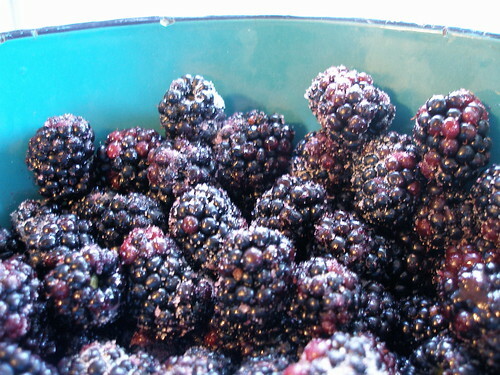 In fact I just bought a quart of black raspberries at a farmer’s market last Saturday (w/o trying one out first). Very yummy. And while making a quick tart with mine, I too was trying to figure out if I could get back to the farmer’s market for more. I suppose with berries, it is something that I’m always surprised by – never knowing if they’ll be juicy and sweet (oh so good) or sour like yours. I guess it’s worth the risk, though! They’ll taste great by January… on some cobbler… oh yes. maybe the takers of the sign were protesting the sour berries. :)cute story! i’m sure you’ll remember it every time you pull out those sour berries next winter too. What a fabulous story. I read every word with great anticipation. Blackberries in the winter. Now that could be sweet! Maybe the people who took the sign were trying to save you from getting a bag of sours. Lol. I bought some fruit from the farm stand up the street and got them home to find they were completely liquefied–90% of them. I was fuming! I just bought some deceptive little blackberries tonight at the market — they looked beautiful, but they are all sour — all SIX baskets that I bought to make a blackberry crisp for friends tomorrow night. Should I sugar them overnight before baking them tomorrow, or not bother? Will they be sweet enough with the baking with sugar?